Jakarta’s GK Cisadane is the first of several GK sites for this country of great history, of bountiful natural wealth and a charming people! Indonesia is also akin to the Philippines, majority of its population belonging to the brown-skinned Malay race. The premier capital city of Jakarta bustles with economic activity while wrestling with an attendant increased population and a daily occurrence of chaotic traffic brought on by its affluence. Not quite hidden in the veneer of its shining success, the nation has its share of poverty-stricken people, living in deplorable conditions where their source of livelihood is limited to foraging for recyclable materials from garbage, very similar to Metro Manila’s Payatas area. 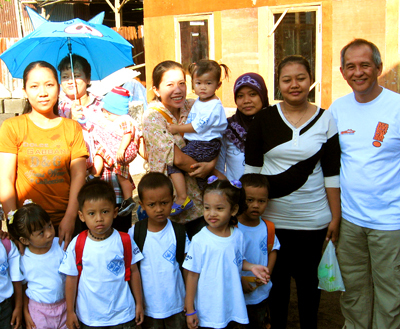 My encounter with the poor of Jakarta was not a fleeting thing, for I’ve witnessed and been a part of a group of dedicated Filipinos who immersed themselves for some years and did the initial actions of bringing glad tidings to the poor via GAWAD KALINGA in the sites at Joglo, Klender, Dumpit. 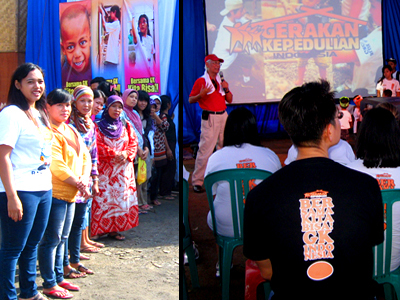 WE worked with the nationals of Indonesia who had hearts for saving and helping the poor. GK Cisadane in Tangerang was not one of the first three GK sites, yet there is still a link from the old site at Dumpit village because the residents are from that former site. The story of the community being raised in Cisadane vice Dumpit is long and painful for the residents (for they were driven out from that land). Needless to say the face of GK, the movement, for the residents changed too, as the caretakers and advocates now belong to members of a new foundation that is fully committed and receptive to the precepts of Gawad Kalinga. The new group of people and families rescued the despondent poor who were ejected from Dumpit from further humiliation. As providence would have it, they secured a piece of real estate at Cisadane, coordinated the work with religious and community leaders in the area, found partners and succeeded in providing new houses for at least 20 families on May 19, 2012. A week earlier they already had a turn over of the multi-purpose hall. 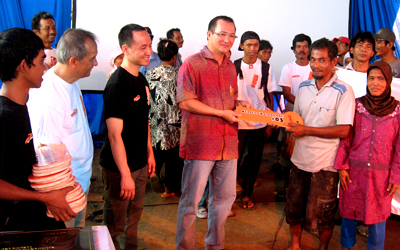 I was in Jakarta to witness this landmark occasion – a turnover of houses for the poor. One will not miss the joy of the new community residents as they saw and experienced for themselves the value of receiving help from men of means! That day will never be forgotten in their lives for they moved to a house they can call their own – with no strings attached – aside from their sweat equity and their commitment to serve & place the interests of the community; yet given to them in dignity and recognition of their being humans being given a dose of hope for better tomorrows. The merriment of the turn over day also brought joy to the following who graced the occasion: the families of Arif and Tintin Rachmat, Arif’s parents and siblings, and their friends, the full time workers of Gerakan Kepedulian*: Suwani, Jack, Audi, Udin, Budi, Zaka, Hadi, Nana, Hanli, Mr. Alex Lee representing GK donor/partner Keppel Corporation, the students of Jakarta International School (JIS) led by the JIS-GK Club adviser Leizel Placer, the President of the residents’ group, the community & religious leader where GK Cisadane is located: Pak Abdullah. The Filipino Gawad Kalinga Team present were Maria Montelibano, Paolo Domondon, Paul Montano, Justin Gunnacao, Rolly and Mabee Unas, Ed and Cel Macesar and myself. *GERAKAN KEPEDULIAN is the name of GK in Indonesia. It means Care Movement. Gawad Kalinga is not a charity, rather, it's an organization that aims to end poverty by building sustainable communities. Indonesia was the first country outside the Philippines to adopt the GK model of development. Gerakan Kepedulian (GK in Bahasa) has grown into a local movement where prominent Muslims and their friends are taking ownership of the work to assist their own countrymen.